About three months ago, I started this blog post. But between my review for Misfits by Garrett Leigh and posting the ice cream recipes that were supposed to go up the next day, I found out something crazy exciting: my husband’s work was moving him (and me) to London for six months. So…hi! From London! Remember me? I’m Elisabeth Lane and I post romance novel reviews paired with recipes. I have a huge backlog of half-finished posts because I couldn’t concentrate on anything else while preparing to move so be prepared for an onslaught in the next few weeks. Yay! As for this ice cream inspired by the OMGAMAZING m/m/m romance Misfits, YO. This stuff is terrific. I don’t know that I can recommend what I did, which was to make two different types of ice cream in three days, but yeah, you should definitely at least pick one and run with it. Both the mango and the coconut are excellent and I don’t even LIKE coconut. And the toppings? They may sound weird, but trust me. Would I steer you wrong? I don’t think so. Of course, having now been to Camden, where Misfits is set (for a talent competition in a gay bar featuring one of my husband’s friends and a whole bunch of other super-talented people, including a gorgeous ginger drag queen with glitter red lips and big, bushy beard), I’m thinking this might have been a little…fussy. But no matter! Now I’m here and I have thus far managed to avoid any crappy chain pubs so let’s hope my streak of finding absolutely fabulous London food continues. And if for some strange reason you haven’t yet read Misfits after I raved about it for MONTHS, then I don’t even know what to say to you. Go get it. Shoo. What are you waiting for? 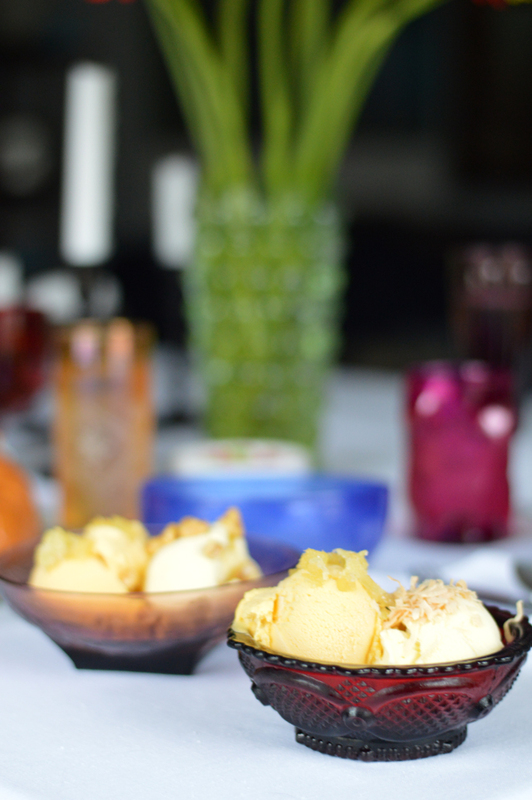 Two fabulously tropical ice cream recipes with toppings perfect for summer. In a blender or food processor, combine mango puree or chopped fresh mangoes, sugar and lime juice. Process until combined. In a large bowl, combine cream and milk. Fold in mango mixture until well-combined. Chill overnight. Process ice cream according to ice cream maker directions. Transfer to freeze-able container and freeze for 8 hours or overnight before serving. In a large bowl, combine all ingredients and whip until combined. Refrigerate overnight. Process ice cream according to ice cream maker manufacturer’s directions. Transfer to freeze-able container and freeze for 8 hours or overnight before serving. Scoop one scoop of each ice cream into serving dishes and top with toppings as desired. For the best canned pureed mango, I recommend hitting an international grocery store if you can. I used an Indian brand of pureed Alfonso mango and it was super-concentrated and delicious. You can also use fresh about 3 large, fresh mangoes in season. I haven’t tried any no churn ones yet! I should though, particularly while in London because I don’t have my stand mixer. Thanks for the suggestion!